Overlooking Loch Fyne, this spacious 4 bedroomed cottage offers stunning views. It's easy to get the whole family together for holidays, Christmas, New Year or celebrations, in our adjoining holiday cottages (please see property 726268). Situated on the outskirts of Furnace village, 9 miles south of Inveraray, Lochview Cottage is a perfect rural retreat. It has an enclosed garden to the front as well as a patio area and larger garden to the back, which leads into woodland. Argyll is one of the most spectacular parts of Scotland with beautiful scenery, mountains, lochs and wildlife.The cottage is an ideal base for visiting Oban, Glencoe, Loch Lomond, the nearby islands and the Mull of Kintyre. It is an area steeped in history, offering varied activities and is a wonderful area for hillwalking, bird watching, fishing and touring. Larger groups or families (max 12) may be interested in renting 'Lochview Cottage' along with our adjoining property 'Lochside Cottage' (property 726268). On the ground floor the comfortable lounge, with large picture windows on two sides, has stunning views over Loch Fyne. It is tastefully furnished with leather sofas, laminate flooring, Sky TV and a CD radio cassette player. Two steps lead to the split level dining area which has a table and 6 chairs and patio doors leading into the back garden. The dining area is open plan to the large fully fitted and well equipped kitchen, which contains all that you need for a self catering holiday. There is also a utility room with a washing machine and tumble drier. On the ground floor there is a double bedroom with an en-suite shower room. Upstairs there is a large double bedroom (king size bed), two single bedrooms and a family bathroom with a shower over the bath. Bed linen (duvets) and towels are included. A travel cot and high chair are available on request. The lounge and three of the bedrooms enjoy loch facing views. The fourth bedroom enjoys views of the woodland. Lochfyneside, with its views to the hills and forests of the Cowal Peninsula, is in a stunning part of Argyll. Bird-watching, walking, diving, riding, golf and fishing are available locally. Red squirrel, pine martin, common seals, gannets, buzzard and golden eagle may all be seen nearby. Lochview Cottage is ideally situated for trips to Inveraray with its famous castle, bell tower, historic jail, maritime museum, shops and restaurants. It is an ideal place to explore the varied Argyll coast with sandy beaches, interesting coastal villages and wonderful sealife and wildlife. Furnace village has a local store and post office (1 mile). For lovers of Scottish culture there are events held locally throughout the year. The area has many excellent hotels and restaurants, many serving local seafood and other local produce. Treat yourself to a meal at the famous Loch Fyne Oyster Bar and Smokery. The large, fully fitted and well equipped kitchen contains all that you need for a self catering holiday. Welcome pack provided on arrival. The property has oil fuelled central heating and the cooker has a calor gas hob and an electric oven. All gas, oil and electricity are included in the rental cost. A selection of board games, books, CDs and DVDs are provided for your enjoyment. The patio at the back of the cottage is equipped with a table, six chairs and a barbecue. There are two wooden garden benches at the front of the cottage and on the lawn at the back of the cottage. A rotary clothes drier is provided. We enjoyed our stay at Lochview very much. The cottage was well cared for, equipped with everything we needed and in a beautiful location. We definitely will stay again when we return to the area! Really enjoyed our stay. House was well kept, met our expectations and the view of the Loch was outstanding. I would give 5 stars but would suggest the double beds have a topper on the mattress as they were too firm. Owners very responsive to our requests. Fantastic location with wonderful views to the front & rear of the Cottage. Would sit for hours watching the boats and occasional people go by, so tranquil. Plenty of space in the Cottage with all the rooms, very clean and comfortable. All the amenities you would need and Wi-Fi that worked well. Good parking facilities right outside the front door and a great sitting area at the back to soak up the late afternoon rays. Plenty of birds to watch and even Red Squirrels scurrying around, the area was so quiet. Great place to use as a base to go sight seeing or just staying in the Cottage and watch the world go by with those fantastic windows! We had a lovely four days at this vacation rental. The house was spacious and well-equipped, and the description of the house and its amenities was accurate. We were two couples traveling together so it was very convenient to have a bathroom on each level of the house. The owners of the house were very gracious to us. We asked for early check-in, and they made that happen. We left a wallet behind, and they notified us and took care of mailing it to us. Overall we had a very pleasant stay -- our only issue was the road noise, especially in the mornings. It's unfortunate as the owners can't change that. 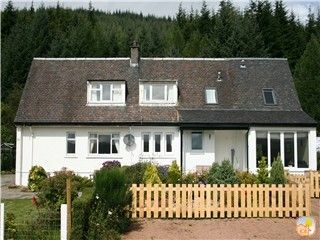 Clean well equipped cottage with lovely view of Loch Fyne. A lovely place to stay, close to Inveraray and it’s attractions. We were blessed with glorious weather for our short stay, which meant we were able to take advantage of the beautiful landscape. We had a nice welcome pack and the cottage was spacious, clean, well equipped and comfortable. The owners have gone to some trouble to provide lots of up to date information about things to do and about wildlife in the area, which was much appreciated. Care was needed when joining the road as traffic moved quickly, however it was not busy most of the time. Would certainly stay again. Beautiful, clean cottage with amazing views of the Loch. We stayed at Lochview Cottage from Dec 26 through Jan 3 and could not have asked for a better experience in Scotland. We travel a lot and this was one of the cleanest cottages we have stayed in. The owners have truly made this a home away from home. There wasn’t one thing we needed that wasn’t already at the cottage. The kitchen is fully equipped, great selection of board games for adults and children and the laundry area was an added bonus. They also supplied a travel cot and high chair for our little guy. Instruction manuals for all appliances and a booklet for local information was so handy. We thoroughly enjoyed waking up each morning to views of Loch Fyne. The cottage is just an hour or two drive from many of Scotland’s beautiful scenes as well as 15 minutes to Inveraray. We would definitely book again if we are fortunate enough to travel to this part of Scotland. Our only suggestion would be possibly a mattress topper for the mattresses just to make them a bit more comfy. All in all this was a perfect fit for our family of seven. We all enjoyed our stay and the owners were so easy to work with from beginning to end. We loved our stay and appreciate the owners letting us make it ours for the eight days we were there. Scotland is beautuful and we hope to be back! Thank you for your very positive comments. We want our guests to feel at home and have tried to provide all that is needed to make it a comfortable and enjoyable stay. We agree that it is wonderful to wake up to views of Loch Fyne and know that the location makes the cottage a perfect base for exploring many parts of Scotland. We look forward to welcoming you back to Lochview Cottage. Argyll, in the West Highlands, is one of the most spectacular parts of Scotland with beautiful scenery, mountains, lochs and wildlife. It is an area steeped in history and offers a variety of activities. It is a wonderful area for hillwalking, bird watching, fishing and touring. Oban, the 'Gateway to the Isles', is less than an hour's drive away and has sailings to the islands of Mull, Iona, Colonsay, Kerrera and other Hebridean islands. It is a busy fishing port with an 18 hole golf course, a cinema, an indoor pool, tennis and squash courts, a good choice of shops and restaurants and a lovely sandy beach at Ganavan Bay. Prices are inclusive of bed linen, towels, central heating and electricity. Smoking is not permitted in any part of the house. We don’t allow pets, apart from guide/assistance dogs. (Arrival from 4pm and departure by 10am). Note: Prices may be subject to change at the owner's discretion.